Delight in a lovely afternoon spent swinging, relaxing, talking and laughing with loved ones on our LuxCraft Roll Back Double Lawn Glider with Cedar Roof. 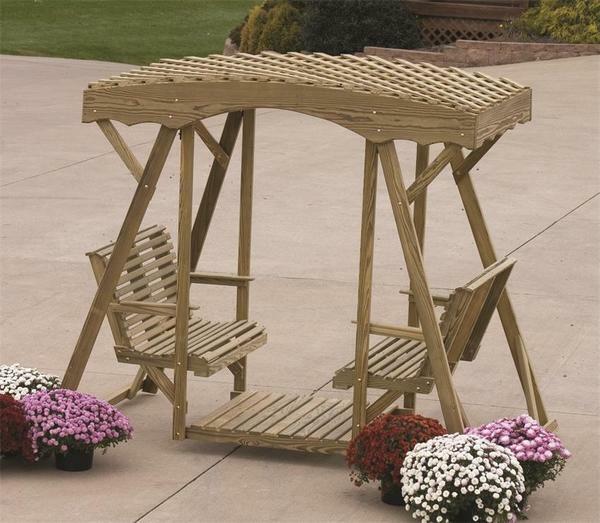 Create a fairy tale garden with this Amish double glider swing as it shields and shades you with your choice of a cedar or open lattice roof! This is the furniture family will run to at your outdoor barbecues or birthday parties. Your Amish glider will seat up to four comfortably This Double Lawn Glider is made from pressure treated yellow pine wood. Standing, sitting or snuggling, your LuxCraft Roll Back Double Lawn Glider will create the ideal place to host your favorite outdoor photos. All of our Amish outdoor furniture is built with durability, longevity and your comfort in mind. Consider our line of Amish Outdoor Benches for your backyard display. This LuxCraft Roll Back Double Lawn Glider comes with stainless steel hardware and some assembly is required. Call one of our Amish Furniture Specialists today at 1-866-272-6773 with any questions and be sure to visit our blog for more information on outdoor seating options.